NCGIA meeting (Photo from the NCGIA Web site: Jake Sopher). 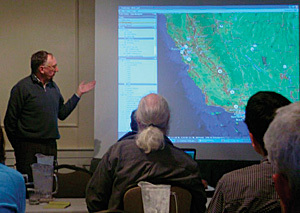 To begin developing answers to such questions, a specialist meeting on spatial concepts in GIS and design was held December 15�16, 2008, in Santa Barbara, California. The purpose of the meeting was to discuss the potential for integrating design more fully into GIS, as well as the development of curriculum in spatial thinking. This was one of an ongoing series of such specialist meetings organized by the National Center for Geographic Information and Analysis (NCGIA) at the University of California, Santa Barbara, over the past two decades. The meetings combine a small number of context-setting presentations with ample time for discussion in plenary sessions, small groups, and informal social gatherings. The meeting was cosponsored by NCGIA and Esri and was attended by Tom Fisher, Michael Goodchild, Fritz Steiner, Carl Steinitz, Ron Stoltz, Jack Dangermond, and a number of other representatives from education and industry interested in the emerging field of GeoDesign. See also "GIS: Designing Our Future."